Income Tax Form-16 is a certificate from your employer. It certifies that TDS has been deducted on your salary by the employer. If an employer deducts TDS on salary, he must issue income tax Form-16 as per tax rules of India. Form-16 is issued once in a year, on or before 31st May of the next year immediately following the financial year in which tax is deducted. In India, one of the most important income tax form is Form-16. It contain most of the information you need to prepare your income tax return in India. Form-16 has two parts Part A, and Part B.
TAN & PAN of deductor. Summary of tax deducted & deposited quarterly, which is certified by the employer. Form 16 Part A must be generated and downloaded through Traces portal. Detailed breakup of salary paid. Deductions allowed under the income tax act (under chapter VIA). If you have held more than one job during the year, you may have more than one Form-16. 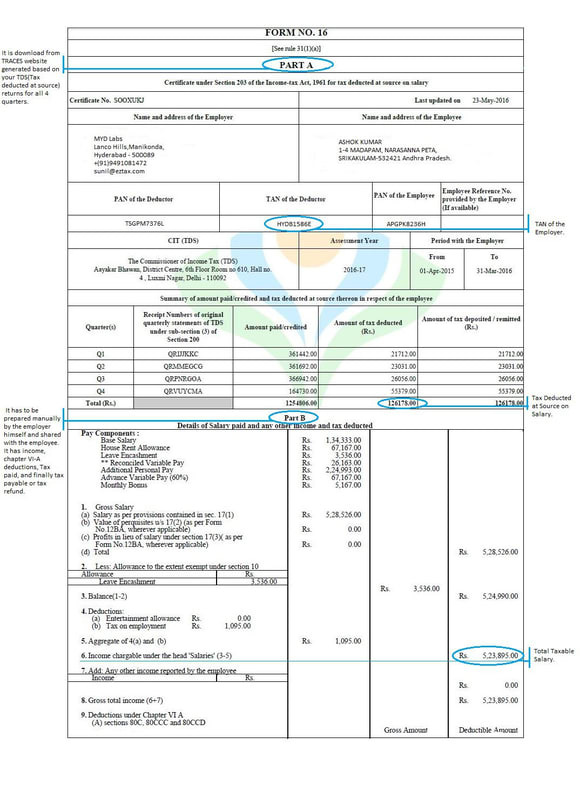 Part B is prepared by the employer manually and issued along with Part A. (Are you an employer? If you are an employer, file your TDS Return here).